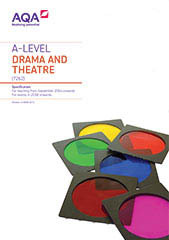 Why AQA AS and A-level Drama and Theatre? Take control and build a course that works for you and your students. Choose the texts, theatrical approaches and practitioners that you know will engage and inspire your students. We believe our AS and A-level Drama and Theatre specifications offer you the flexibility to teach Drama your way. Our AS and A-levels also provide strong stand-alone qualifications, with real and credible value for students in both higher education and in their future careers.